It is often commented by the rationalists and others, as to why the Hindus have great reverence for the River Gangaa; why is it more special once in every twelve years (Pushkara); how a dip in its water cleanses the sin, if so, why the pebbles or fish or other species in the river are not liberated. Many religious practices are not known or understood by all ordinary followers (laymen) in any religious community. All do not have right attitude and sufficient time to devote to study the scriptures and the philosophy behind, which may take years of rigorous training. Modern ‘intellectual’ having no formal education and training in the field of religion and philosophy, pass uncritical comments to tarnish the holy image. First of all, a non-believer, the so-called ‘rationalist’ or ‘secularist’, does not have a locus-standi to question a believer as far as it doesn’t infringe his right to be otherwise. The dialogue between reason and faith is unending. Reason governs the mundane world where as faith is related to the world beyond. Logic connecting these two planes is however double-edged. In Bhaarat, many Rishis who were already Jnaanis did severe penance to unravel the mysteries of Creation for the benefit of entire humanity. The Saastraas and commentaries have come to bring those revelations to the intellectual level so that a serious seeker can understand and practice the methods. Customs and rituals are designed based on Saastraas to bring the benefits for common use by the laity. Religious practices, customs and rituals in Bhaarat have always been reframed, redesigned and transformed to suit the time and clime by the ‘learned’ wise. Religion in Bhaarat was never static. The Hindus if it terms the people of Bhaarat never had an ‘ism’ as non-Hindus call it today as Hinduism. Even the present religion of the Hindus is a multipath approach to the single Godhead. Bharateeya culture has recognized the freedom of every individual to choose his own path for his spiritual journey. The Hindu religious practices, customs, vratas or festivals and rites have a scientific base. Our Vedas reveal the secrets of cosmic phenomenon and the knowledge is well recognized by the modern scientists as Vedic Cosmology or Vedic Astronomy. 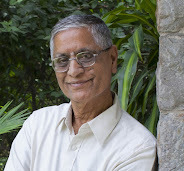 The Days or the Tithis, the Nakshatraas, the twelve Grahas, the Samvatsaraas, the holy days (the Parva dinaas), the eclipses, the moon’s movement, for that matter all the Hindu religious practices are related to one or the other secrets connected to some important astronomical or cosmic event in the Universe. Therefore the Hindu religious practices could be understood at four levels depending on the receptive capabilities of a follower. The levels of (i) practitioner (Vedic), (ii) seeker (Upanishadic), (iii) knower (Puraanic) and lastly (iv) the laity (Itihaasic) may seem to be different but the assured result of all these pursuits is one and the same. The Pushkaram is a periodic cosmic phenomenon happening every 12 years to a holy river, the foremost being the entry of Brihaspati into the constellation of Kumbha, which signifies Kumbhamela (popularly connected to Khseerasaagara Manthan, a great Cosmic event describing the process of Creation) causing Pushkara to the holy river Gangaa. We have twelve holy rivers recognized in our country, Bhaarat, which undergo Pushkaram for every 12 years by turn. Brihaspati enters into 12 constellations in about 12 years and each river signifies one such holy event. This would facilitate the people at different places to have the benefit of taking holy dip in the river flowing nearby once in every 12 years during its Pushkaram. It is not necessary to go to a distant place to have the holy dip if one can’t afford it. The Gangaa on the earth is a jnaana vahini, which was brought down from the Milky Way on to the earth by Bhagiratha for the benefit of humanity. To wash the sin of his forefathers was only a nimitham (secondary). It is a great cosmic event and the Gangaa associated with Brihaspati, the symbol of wisdom, has the efficacy to wash any amount of sin of any number of people for all times to come. This is not an unfounded belief. Bhagiratha could have washed away the sin of his erring forefathers through his ardent tapas or any other already known rituals. But the technology involved in bringing down the pious waters on to the earth was meant for all those who could not do any serious effort to wash off their sin and become eligible to attain Jnaana. In ancient times, religion was not used for personal ends. They were aiming at the welfare of the entire mankind. Mythically Pushkaram signifies the entry of Pushkara into the river water along with all gods and goddesses, which makes the water of that river pure for another 12 years. The entire year is considered holy to have the dip because earthly one-year amounts to only one divine day. This is another cosmic secret. The second question is: Why are the fish and the pebbles in Gangaa not attaining Moksha? The Vedic learning reveals that the plant is simply a life-matter without a ‘jiva’, the experiencer. The animal has an experiencer, ‘jiva’’ but without an awareness of its existence. Man alone is endowed with a ‘jiva’ along with self-awareness. The rationalist should at least have known that the lifeless things (like pebbles) couldn’t have ‘jiva’. The very term ‘jiva’ indicates an entity associated with life. Even among men, those who strongly desire for Moksha alone will attain it. Fire purifies the physical body and water washes away his mental state and then Jnana descends and dissolves his ‘self’. What remains is a positive Zero, the Brahman. Mother Gangaa, the Bhageerathi, does all the three in one holy dip if one leads his later life in that state of Brahmana. The Gangaa is pure irrespective of the fact whether its water is clean or otherwise. Purity is different from cleanliness. Should we not keep it clean is of course a vital question. Every one of us should feel our responsibility, more so the modern rationalist who should also account for the indiscriminate growth of industry at the expense of nature.